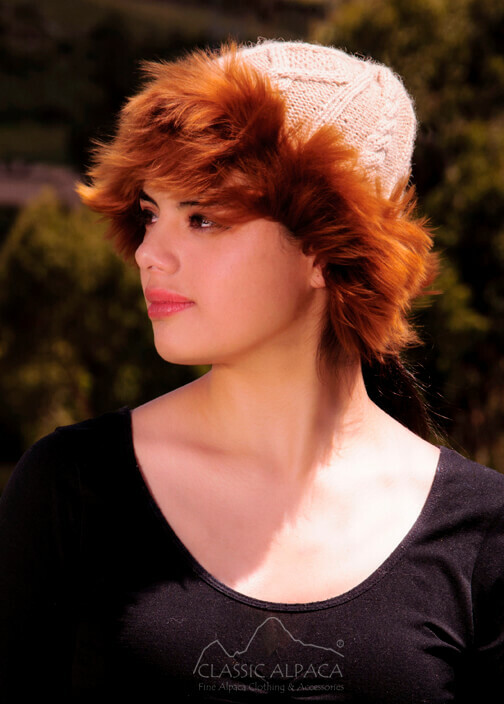 Stylish and beautiful Alpaca Fur hats in many color combinations. This elegant and attractive design is handmade with an eye-catching Fur trim. It's incredibly lightweight, soft, warm and provides perfect fit! No alpacas are harmed for this purpose. Composition: 100% Alpaca Superfine & 100% Super Baby Suri Fur. There are two ways of washing your alpaca wool hats: hand washing and machine washing. Fill a container with cold water, pour shampoo and carefully rub the alpaca hats with the hands. Soak them in the water with care for two or three minutes. Rinse with cold water. To avoid your alpaca hats from losing their shape, press slightly to remove the water. Never wring. Dry flat, reshaping the product and keeping it from direct sunlight. Wash and dry after turning hats inside out. Wash in a mesh laundry bag to reduce agitation. This will avoid the alpaca hats getting stretched and losing their shape. In some climates moths could cause a problem. If this is your case, place your alpaca wool hats in plastic bags with small scented bags, or place cedar chips in the storage area.